Are you impatiently waiting to get your spring garden started? I sure am. This month, we had a few warm teaser days and all I could think about was getting out in the garden and playing in the dirt. Well, guess what? Even though spring is 32 days away, we don’t have to sit idle any more! Seed starting is a great way to get a jump start on spring planting, save some money and get your gardening fix! Starting seeds indoors isn’t all that difficult but, there are a few tricks that can ensure an abundance of healthy plants. 1. Plan before you plant. Decide on the vegetables to grow. I always choose vegetables my family loves to eat. Also, you might choose plants that are difficult to find in the local nurseries or too expensive to buy. Remember, not all seeds need to be started indoors. Vegetables like lettuce, carrots, beets, and peas do well in the cool weather and it’s better to direct sow them into the ground as soon as it’s warm and workable. I recommend you don’t waste your indoor space starting these seeds. 2. Read the seed packages. You can learn a lot just by reading your seed packets. For example, did you know that some seeds need presoaking before planting? And some need to be chilled in the fridge? While most seeds do fine planted straight from the package into the ground, there are a few that need special treatment. In addition to special needs, the seed packages will tell you how deep to plant and how many days it will take them to germinate. 3. Don’t start seeds too early or too late. For successful seed starting, timing is important. Start too early and your plants will become root bound, forcing you to do transplant into larger pots. Start too late and your plants won’t be ready in time for outdoor planting. The first step to proper timing is find your plant hardiness zone and the average last spring frost date for your area. If you need help figuring it out, ask your local cooperative extension. Also, ask them if they have a seed starting calendar. Last year, I found an awesome vegetable planting guide for the state of Virginia, including recommended planting dates on the Virginia Cooperative Extension’s site. Your state may have something similar. Another helpful tool is an online planning calendar. There are plenty of downloadable calendars out there on the web, but the most comprehensive one I’ve seen so far is the free garden planning calculator offered by Seeds for Generations. All you need to know is your average last frost date and the calculator does the work for you figuring out the important dates. Pretty cool! 4. Start seeds in the right containers. There’s no shortage of options for seed starting containers but some are better than others. For example, I’m not a fan of peat pots. Moisture control is difficult. The pot soaks up the moisture from the soil, and while the pot appears wet, the soil is actually dry. Plastic pots are my favorite seed starting containers. You can buy pots or trays specifically for seed starting (I use and love these reusuable ones!) or you can repurpose your yogurt cups, sour cream containers, lettuce or rotisserie chicken bins. If you go this route, be sure your container is at least 3 inches deep and make drainage holes in the bottom. Lastly, always start with clean containers! If you are reusing containers, wash them with a bleach mixture made with 1 part bleach to 9 parts water before soaking in the bleach solution for 15 minutes. Then allow them to air dry completely before you use them. 5. Don’t use regular potting soil. Light and porous soil works best for seed starting. Regular potting soil tends to be too heavy and dense. Same with your backyard soil, which also carries many disease organisms that makes it even more difficult for healthy germination. According to Gardener’s Supply Company, the best soil mix for seed starting is not really soil at all. It’s a growing medium comprised of sphagnum peat moss and small amounts of vermiculite and/or perlite. This blend helps ensure a consistently moist environment to encourage good germination. It is also light enough to provide lots of wiggle room for tiny roots. Just as importantly, it has been sterilized to eliminate bacteria and fungus which can cause problems such as — damping off, — a disease that kills seedlings. Buy seed starting mix (I use Jiffy’s Organic Seed Starting Mix.) or you can make your own. Your vegetable seeds are going to want bright light. I am sure you have heard of the term “leggy” before. What that means is that your vegetable plants (after the vegetable seeds have germinated) are not getting enough light, so your vegetable plants are “stretching” towards to closest light source. This will produce a stem on your vegetable plants that are long and weak. When starting seeds, Mike advises us to use fluorescent lights, keep the lights on for 12-14 hours a day and to always keep grow lights 3 inches above the plants. Read all of Mike the Gardener’s grow light advice here in Use Grow Lights to Start Seeds. 7. Keep the seeds moist. Seeds need to be kept evenly moist in the germination phase. If you over-water, you run the risk of having diseased and moldy plants. If you under-water, you’ll have no plants at all! One trick for keeping the soil’s moisture level consistent is to create a mini greenhouse environment. Loosely cover your containers with clear plastic—a plastic tray cover or plastic food wrap—until the seeds germinate and pop through the soil’s surface. But, be sure to poke holes in the plastic with a toothpick or take it off the containers for a short time every day to provide air flow, preventing too humid of an environment. Lastly, I’ve found watering from the bottom is the best way to keep the soil moist. Set your containers in a tray and fill the tray with an inch or two of water. The soil will “wick up” the water through the pot’s drain holes. When the soil is moist to your finger’s touch, remove the remaining water from the tray. How has your experience starting seeds been? 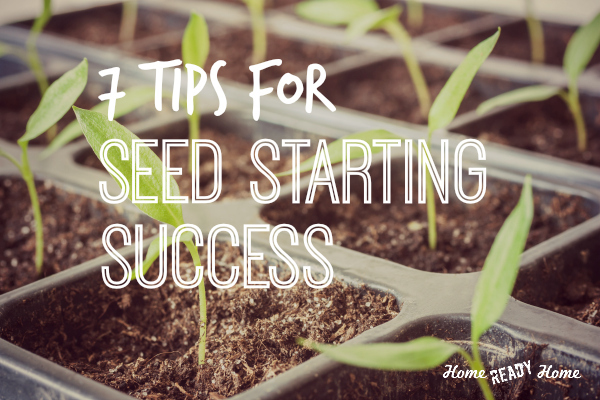 Do you have any seed starting secrets? Share your tips with us in the comment section below. Previous articleIs Expired Food Safe to Eat? Is Expired Food Safe to Eat?